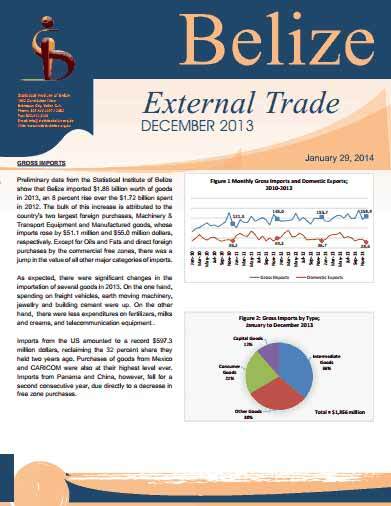 The Statistics Institute of Belize has released the trade numbers from last year. There are some interesting numbers on there. "As expected, there were significant changes in the importation of several goods in 2013. On the one hand, spending on freight vehicles, earth moving machinery, jewellry and building cement were up. On the other hand, there were less expenditures on fertilizers, milks and creams, and telecommunication equipment. Imports from the US amounted to a record $597.3 million dollars, reclaiming the 32 percent share they held two years ago. Purchases of goods from Mexico and CARICOM were also at their highest level ever. Imports from Panama and China, however, fell for a second consecutive year, due directly to a decrease in free zone purchases."